UC Berkeley Police Lieutenant Lee Harris apparently sent an email to his Chief Margo Bennett in 2015 depicting a Black man holding a sign reading "no mother should have to fear for her son's life every time he robs a store." The lieutenant wrote above the picture, apparently an internet meme making fun of Black Lives Matter protesters, "thought this would make everyone smile." The email was first reported by the Daily Californian. The Express also obtained a copy of the email from an anonymous source. The Daily Californian confirmed from the university that the email was sent by a "police officer," but the University would not confirm his identity. The Express was unable to reach Bennett by telephone today. The department's public information officer was also not in her office. University spokesperson Janet Gilmore told the Daily Californian that Bennett "verbally reprimanded" the lieutenant for sending the message. But university records show that Bennett also promoted Harris to captain after receiving the email. 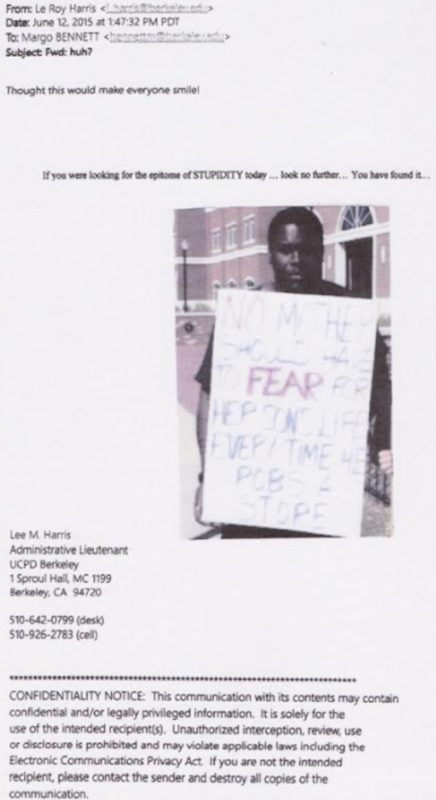 Harris currently is in charge of "administration and community outreach" for the department. Harris did not answer his phone when called. Last year, Bennett had her department gun stolen from her vehicle after parking it in Richmond. Bennett was appointed chief of the campus police department in 2013.